For those in the know, this past September in San Francisco, Pine and Gilmore held their annual thinkAbout. 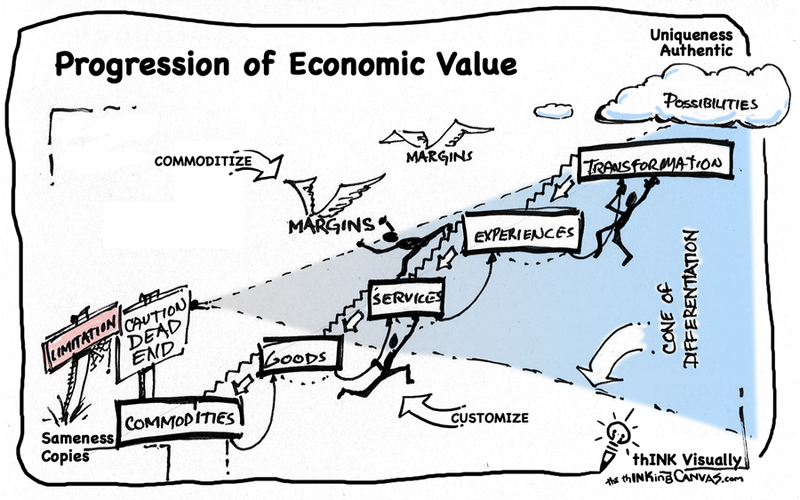 An event that embraces the concepts and principles that drive or evolve economic offerings into an experience. Unfortunately, my attendance was hampered this year by many issues, too many to bore you with. Instead of sulking in my pity and sorrow of not attending or participating, as Joe Pine would clarify, I dove back into the books (TEE and TEE2) and began my visual thinking exercises. My focus was to look at the models presented by Pine & Gilmore with a fresh perspective. How else could I interpret the concept? It is always a challenge to take a well communicated concept and give it a new spin. We are conditioned that once we accept an idea we rarely attempt to change our thinking to expand or challenge the concept, yet that is what visual thinking helps us do. So I set a pen to paper and mind into investigation mode. My query for this visual mapping was to reinterpret how the idea could be represented to illustrate the challenges or downfalls of the attempt or avoidance of evolving an offering to the next level. My direction was to look at the concept from an opportunity aspect and here is what manifested. That was not the only idea I decided to attempt, I took two other ideas and applied the same idea as visualizing them into visual pieces which could convey more meaning with less written language to define them. 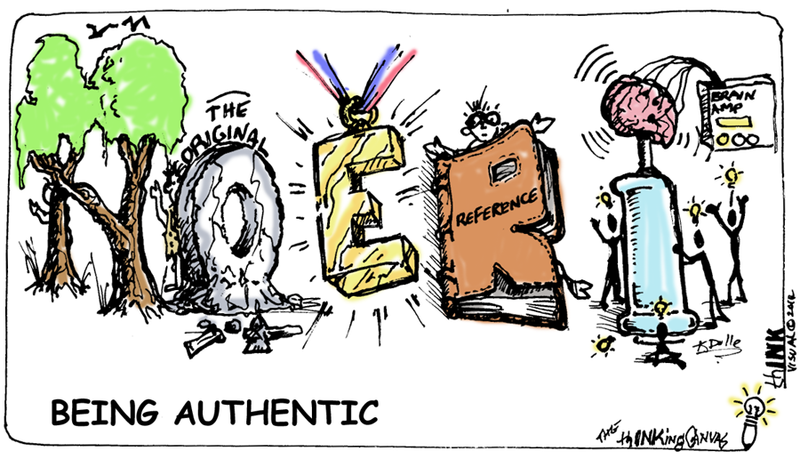 The first is the elements of authenticity know as N.O.E.R.I (Natural, Original, Exceptional, Referential and Influential). The last concept or principle was that of polarity. Polarity plays a strong part in the process of creating an experience. It is not always about pairing up opposites, it could be simply how opposites can work together or in succession. Las Vegas is a wonderful exemplar of polarity. From tourist trap by day to Sin City by night. Las Vegas never sleeps nor do the people who fill the casinos, bars, nightclubs and theaters. It draws revenue from both sides of the 24 hour cycle. There are offerings that do play the polarity card very openly to create a new experience. Build-A-Bear reverses the role of the consumer to become the worker. By employing the act of customization, the consumer builds their own product. There are consumer paid experiences where you, the consumer, pay to experience a day in the life of a farmer, weaver, pottery maker, etc.. Role reversal is a growing part of those movement. Now, these were some quick, off the wall concepts, but you can see how the concept could spark some interesting events and experiences. Who knows, maybe these will spark an idea for you and your business offering. 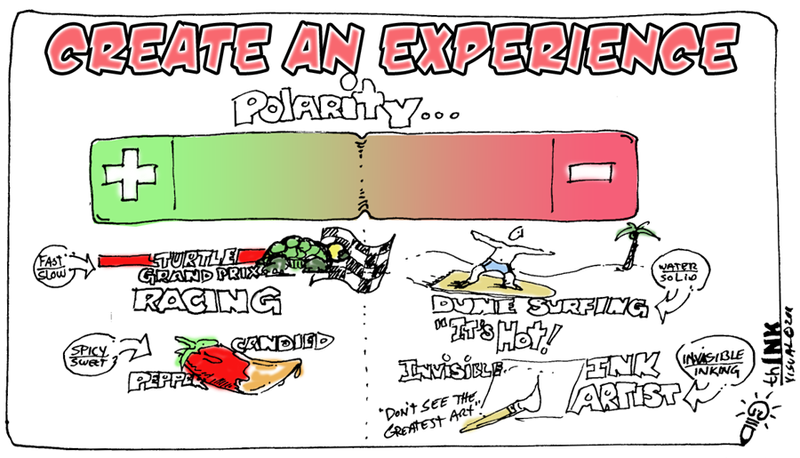 What could you do to your product or service that can have polarity applied to create an experience? Let’s visually thinkAbout it and see.